Mar. 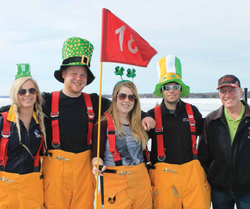 19, 2015 10:00 a.m.
Pigeon Lake Regional Chamber of Commerce hosted its 19th Annual Ice Golf Tournament on March 14, 2015 and with a St. Patrick’s Day theme, it was a colourful event, albeit a primarily green event. The day started at the Mulhurst Bay Royal Canadian Legion #246 where breakfast was served by Legion members. Ice golfers registered to get their supplies, the rules and a number of fabulous coupons to redeem at regional businesses. After the 1:00pm cannon start, the day on Pigeon Lake’s Ice Golf Courses was nothing less than fantastic! The wind died down just in time and the sun beamed on the merry crowd. A horse drawn sleigh toured participants and spectators around the ice. The Mulhurst Bay Fire Department served free hot coffee and hot chocolate and they even drove around delivering it to thirsty golfers and spectators. Imaginative hole sponsors added fun and personality to the courses and some even added free food and drinks! A blazing bonfire welcomed spectators and Ice Game participants and offered warmth to the chilled. Hay bales provided backdrops and comfy seating for those needing to take a load off. It was great fun and a cheerful green spectacle that must be seen to be appreciated. Plan now to attend next year. This is Alberta ice golfing at its finest. With carpets for greens and recycled Christmas trees planted throughout, the golfing is basically no different than the summer game, with mounds of snow serving as tees and brightly coloured golf balls that just might bounce wildly away across the ice. Pigeon Lake Regional Chamber’s Ice Golf Tournament reinvents the game of golf, Alberta winter style! While no one was quite successful enough to win one of the $10,000 hole in one prizes, everyone walked away a winner by the end of the day. Many sponsors, donors and volunteers made it all happen. Pigeon Lake Regional Chamber of Commerce definitely has the very best and most versatile volunteers around. They approached our sponsors & donors, they hauled trees and greens, built the nine hole Ice Golf courses (complete with the aforementioned trees and greens), they sold tickets, decorated and worked the many elements of the event, including take down & clean up. They’re still working on cleaning up the final bits and they’re already preparing for 2016. We love our volunteers! Hug a volunteer today! The Honoured Winners of 2015’s 19th Annual Ice Golf Tournament included two teams who tied. With scores of 22, the winning teams were Pigeon Dynasty (Captain Victor Bailey, Jesse Bailey, Eric Addie & Dave Rennick) and The Sandbaggers (Captain Patrick Lough, Dave Storie, John Hauptman & Cade Johnston.) Many other award were handed out from best costume, closest to pin, and Elite Audio Video’s ‘Chip For Electronics’ prize. Next year the Tournament celebrates it’s 20th Anniversary! Check out www.icegolf.ca for more info. Photo: Wayne, Travis, Rochelle, Ryan and Alanah of the Mulhurst Fire Department had a great time golfing. Photo by Christina Komives. More photos in this week’s paper.